June and July are time for County shows all over the country. This year at the end of June I agreed to help my good friend Phil Brown out at the Kent County Show. 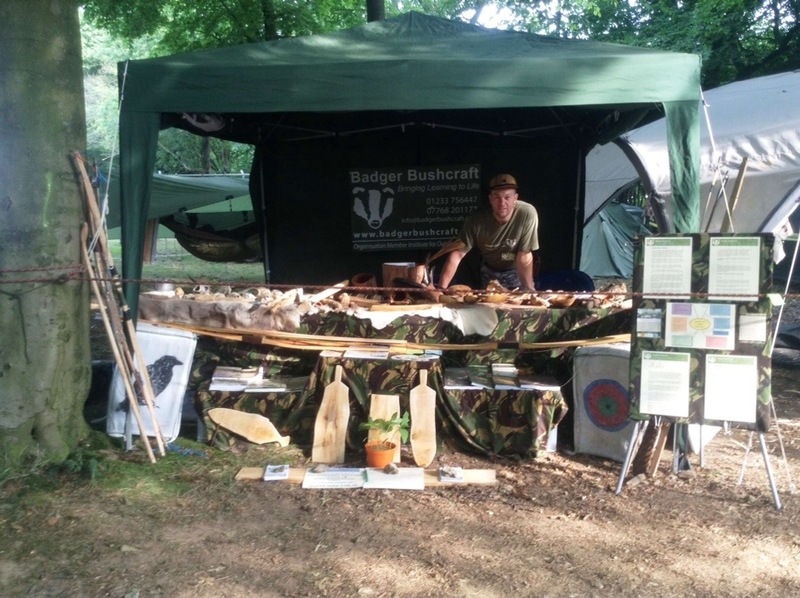 Phil runs his own bushcraft company called Badger Bushcraft. 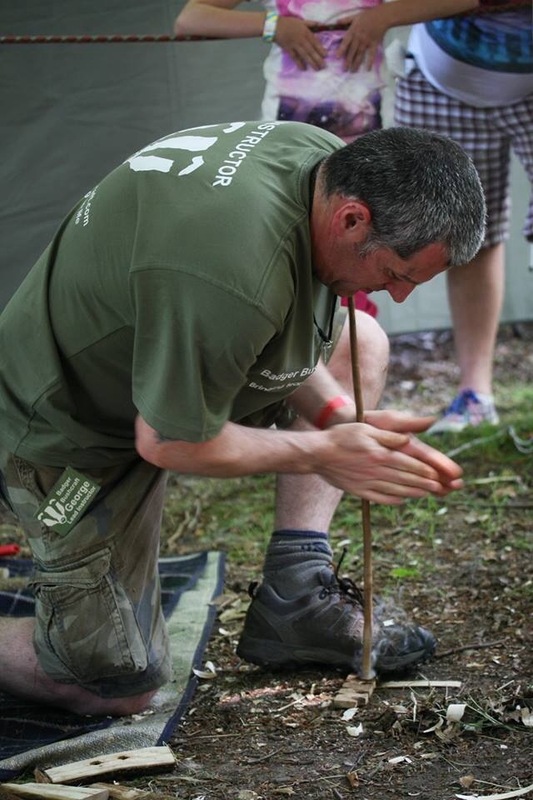 Phil is based in Kent and does a lot of work with schools in the South East of England. 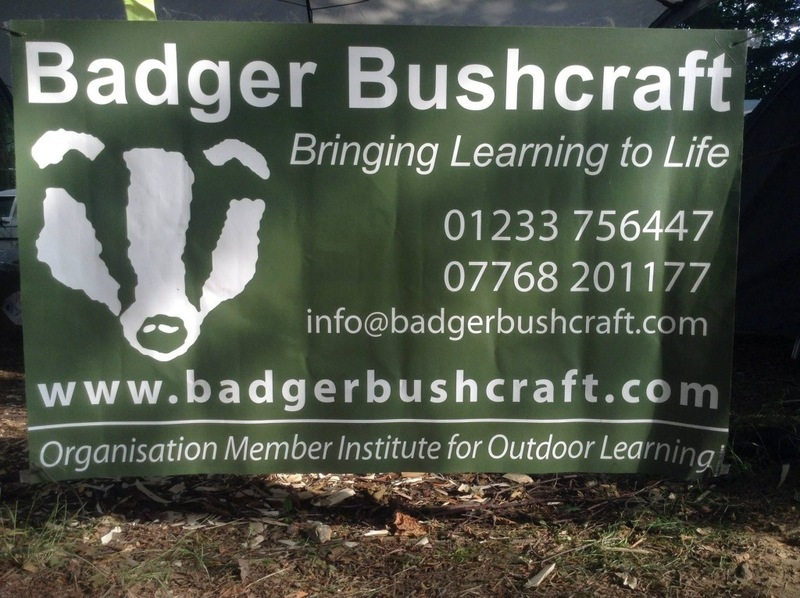 His website at Badger Bushcraft covers all the angles on how he works with schools so I will not go into depth on that here. I have known Phil since about 2005 and we have both studied together under John Rhyder at Woodcraft School on a number of his courses. Just like in the forces you go on long courses, meet people, go through some pretty hard stuff (and good stuff) and come out at the other end with some good friends. Phil is one of these good friends and over the last few years has given up his time to help me out on my Sea Cadet courses so it was only right to help out where I could for him. 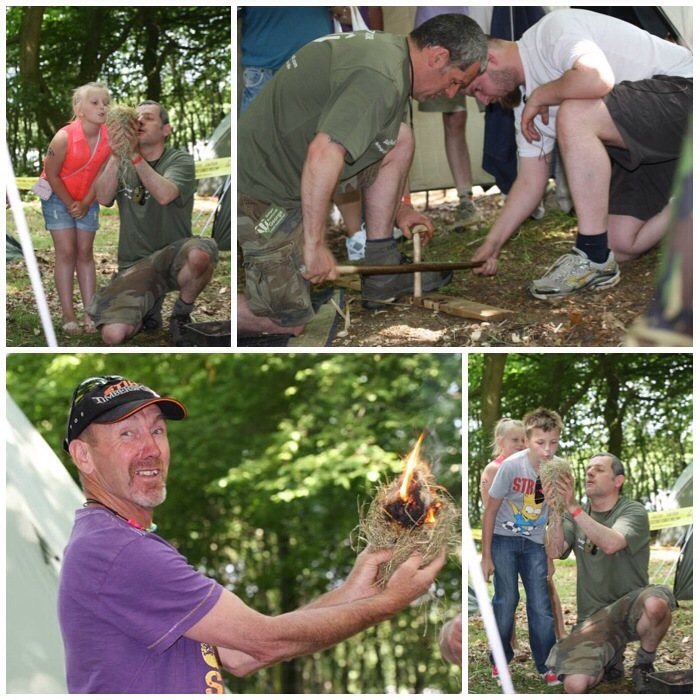 Not difficult as we both share the same passion for teaching bushcraft. Phil’s aim for the weekend was to network with visitors who had links with schools. All the craft items were for display purposes. My role was to demonstrate some activities. 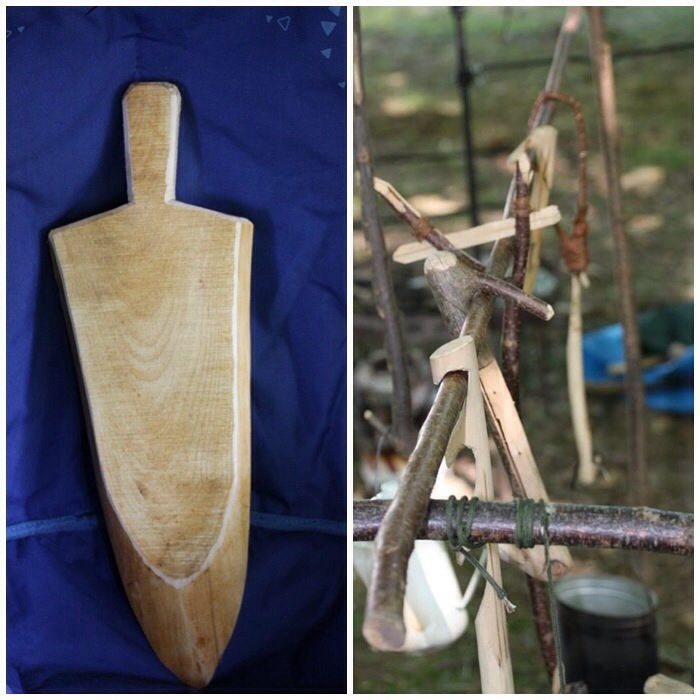 These included, using firesteels, bowdrill, hand drill, knots, carving and looking at hammocks set ups. Phil had his own shelter for the craft items and I brought along our own Coleman Event shelter to do the demonstrations. I am glad I brought it along as the heat all weekend was very intense. I brought along some of my craft items and so did Phil. We could hardly fit them onto our tables in the end. I lost track of the times people came up asking how much we were selling things for. Some could not believe that we were not here to sell stuff but to just network and demonstrate. The hat you can see in the picture Phil found in Romania. 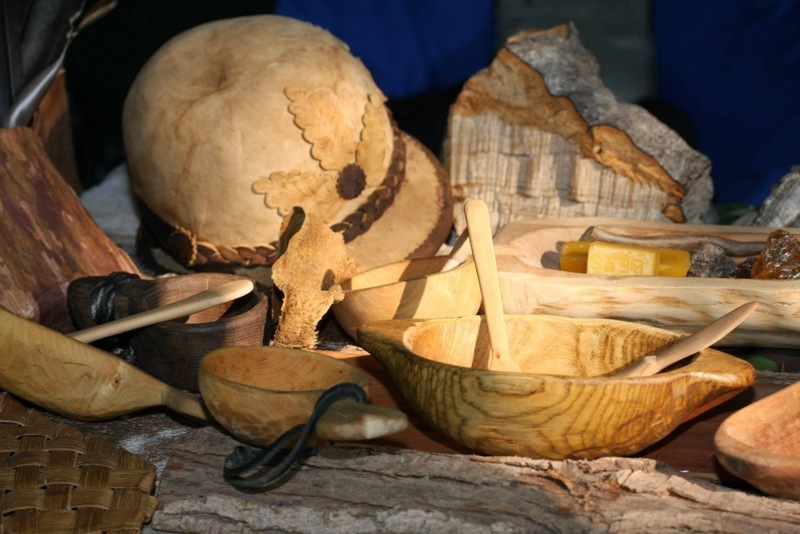 It is made out of amadou from the bracket fungus Fomes fomentarius. A good explanation can be found here on Wikipedia. Running over the weekend was a small competition. It was to identify the plant shown here at the bottom of the table. 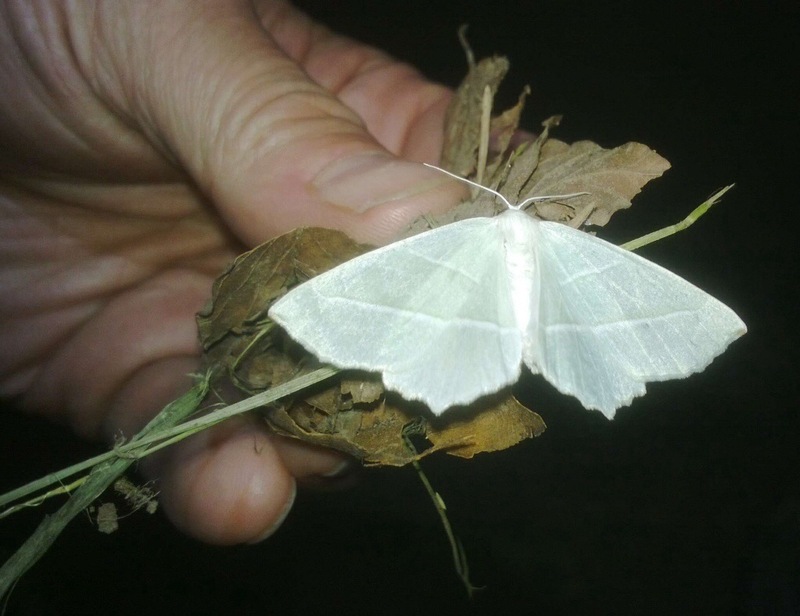 It is highly toxic and was very hard to ID (I had no idea what it was until told). People got a chance to use some ID books to find out what it was and we got an eventual winner. The prize was a weekend course with Phil if I remember. The plant if you have not guessed it is a Thorn apple (Datura stramonium) More info on it can be found here at the RHS web page. 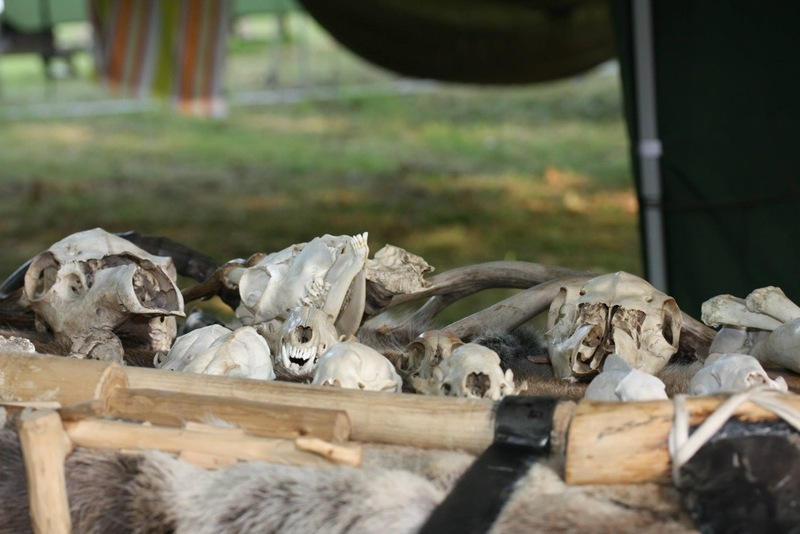 I must admit to being impressed with the skull collection that Phil now has. They were a real attraction to all the kids. 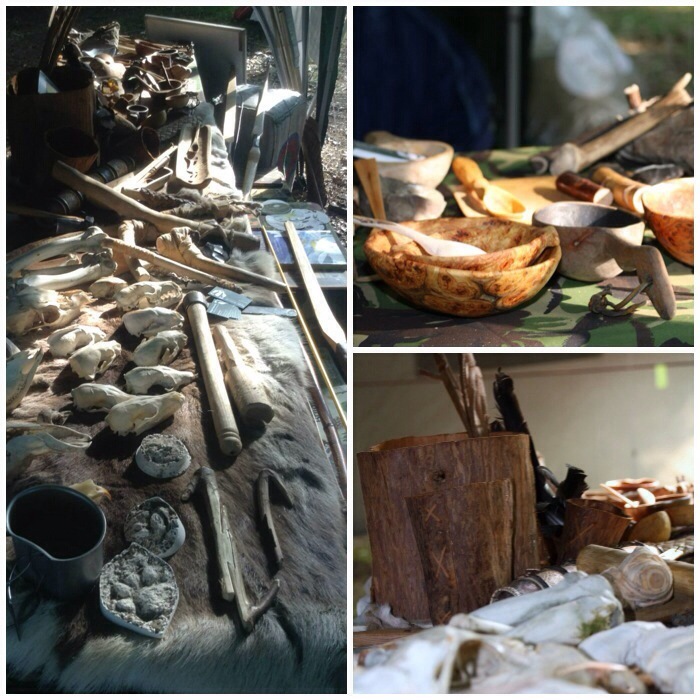 Much of my time was spent in the demonstration area. It got very crowded at times. I spent a lot of time working with adults and kids doing group bowdrill and practising using firesteels. The kids waited patiently until it was there turn and wherever possible I worked with groups of 3 or 4 at a time. I did a number of one to one sessions with adults and a few got that final happy flame face I so love to see. Interspersed in between the bow drill I got the hand drill out. 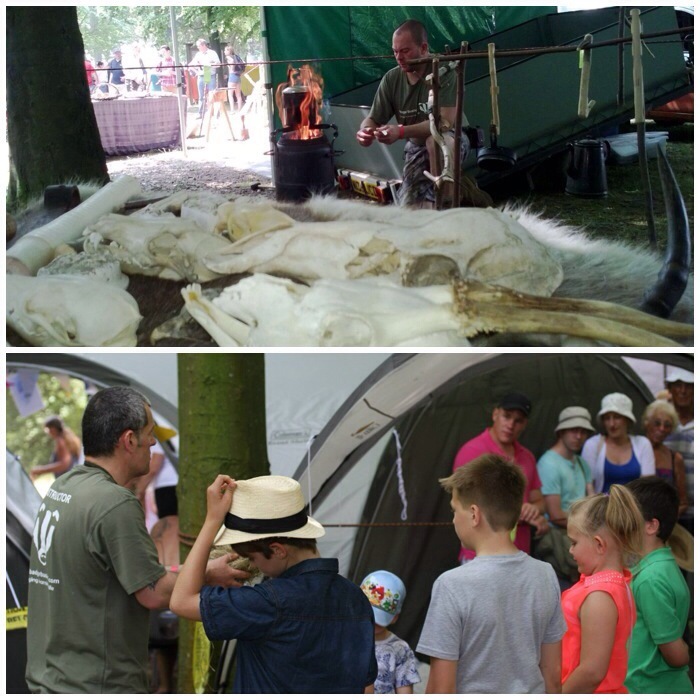 I think I did 4 demonstrations on the Saturday which thankfully were all successful (it was very hot and dry so ideal conditions) but I did collect a couple of blisters and my hands did feel bruised. At the back of the shelters we had set up home. I had a few people asking about the hammock set up. 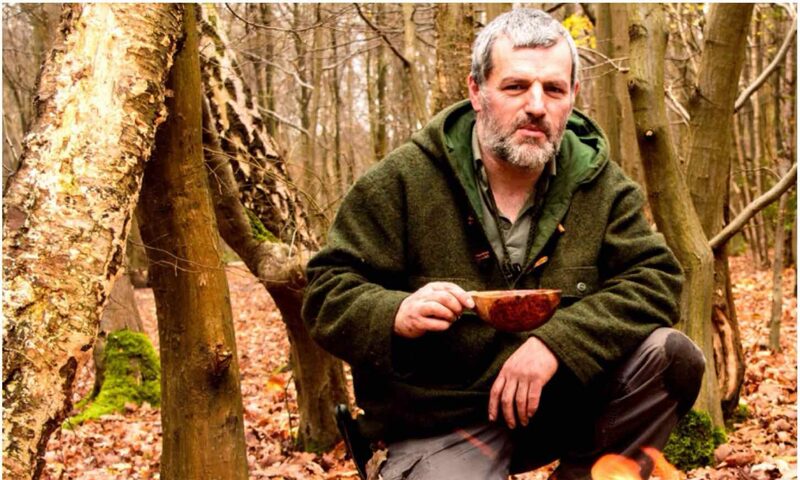 My home is the hammock – Phil has the tipi. No roughing it here. Around the fire that evening we had a little visitor that wanted to dive bomb the fire but thankfully chose not to do so at the last moment. 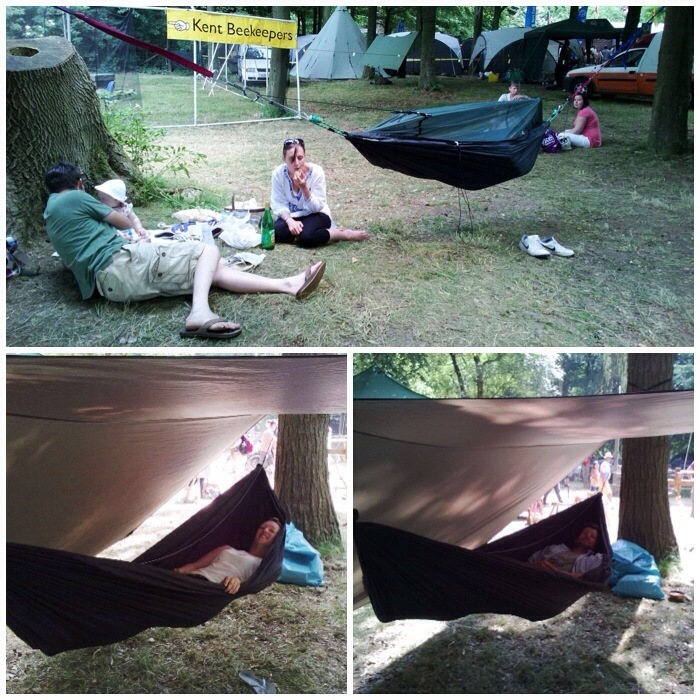 On the Sunday i set up a couple of different hammocks for people to try. Everybody was a bit nervous at first trying them but those that did were converted. 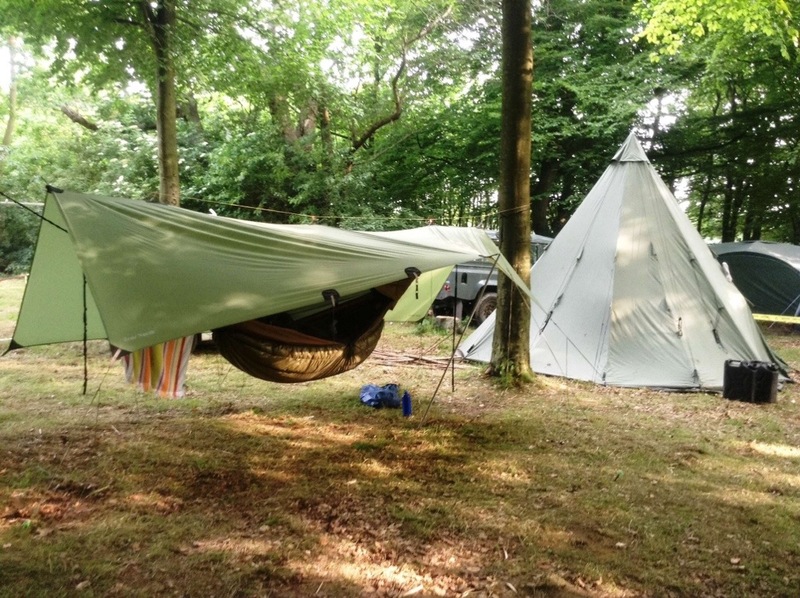 The hammocks that I set up were the DD Frontline and the UK Hammocks Woodsman. I tried out one of Phil’s Ben Orford hook knives and it worked a treat. I quickly cut out the inside of a small bowl. 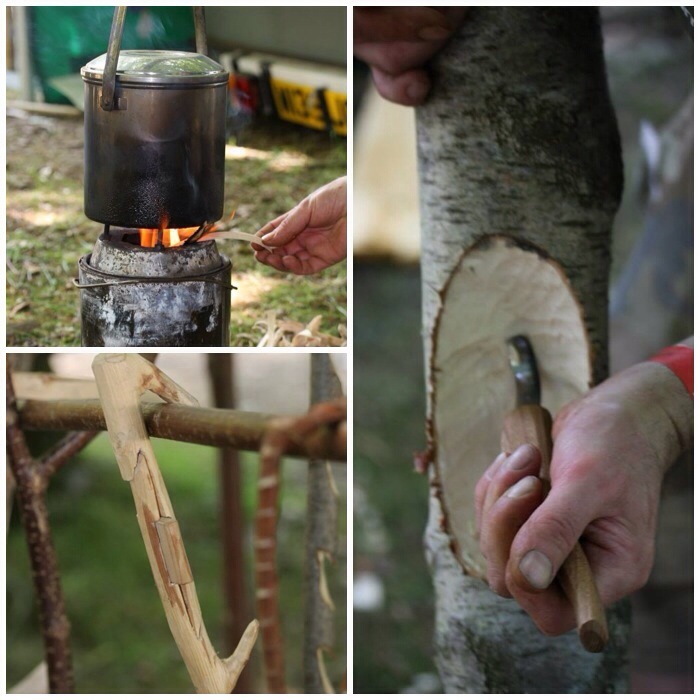 I was working on a small birch log and explaining to people as they came by what I was up to. The bowl has seasoned now and hopefully will be a Christmas present. 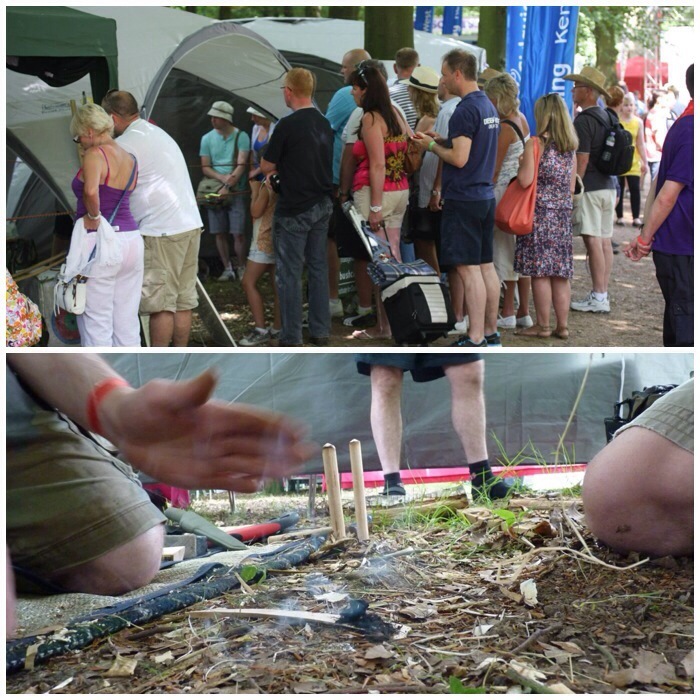 I demonstrated my gas wood burning stove and discussed various styles of pot hooks. 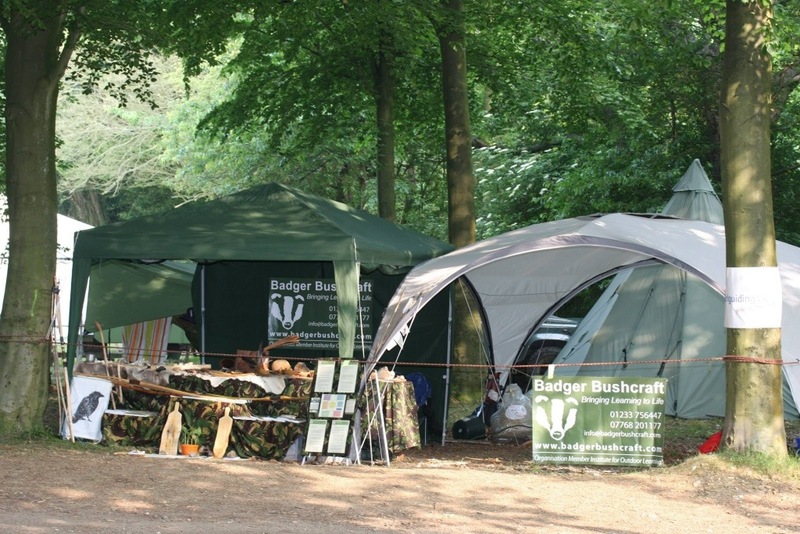 We had set up an area with some stoves and different types of pot hooks for people to look at. Also one of our neighbours had a mobile planing machine. He had been making planks out of Birch and the off cuts were donated to us. 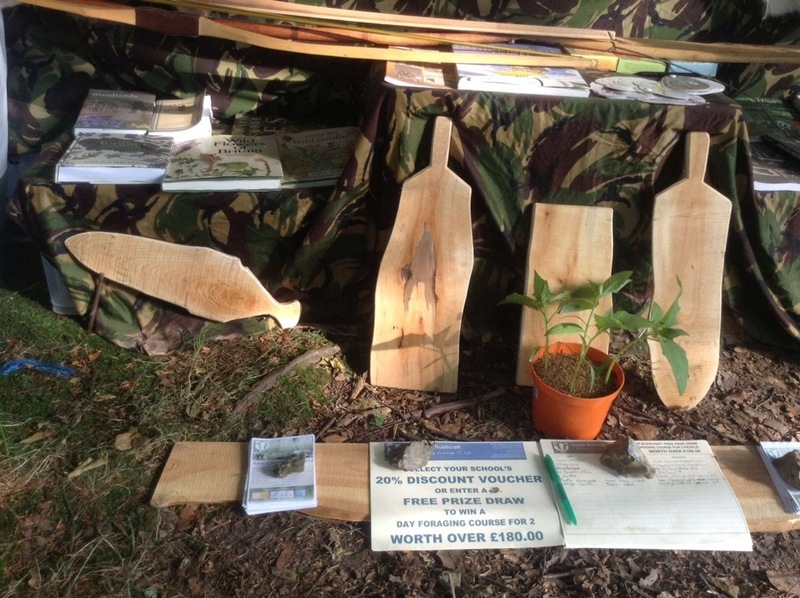 The sensible thing we could see was to carve some chopping boards out of them. I think we gave away a few in the end to people who stopped to chat and were really interested in what we did. 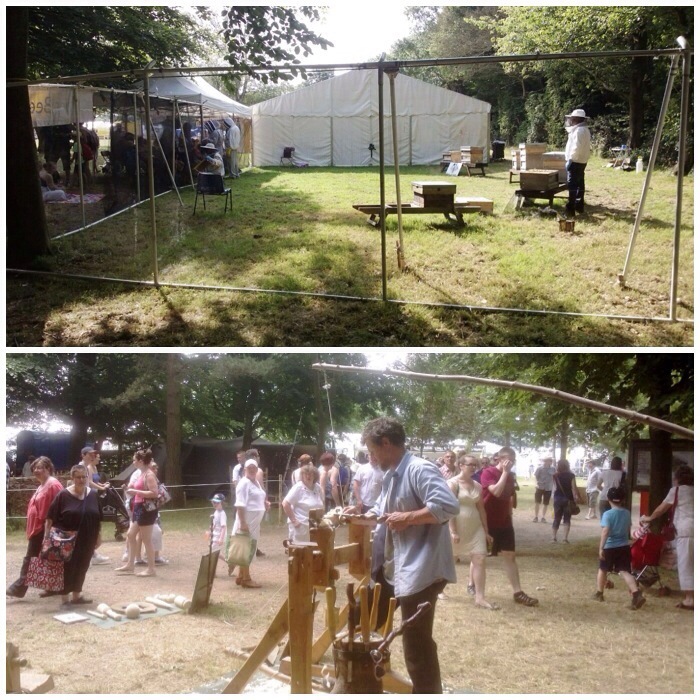 Other neighbours included the Kent Beekeeping Society and Steve who was an expert wood turner. Phil got his Eco Burner going. Really outshone my little gas wood burner. 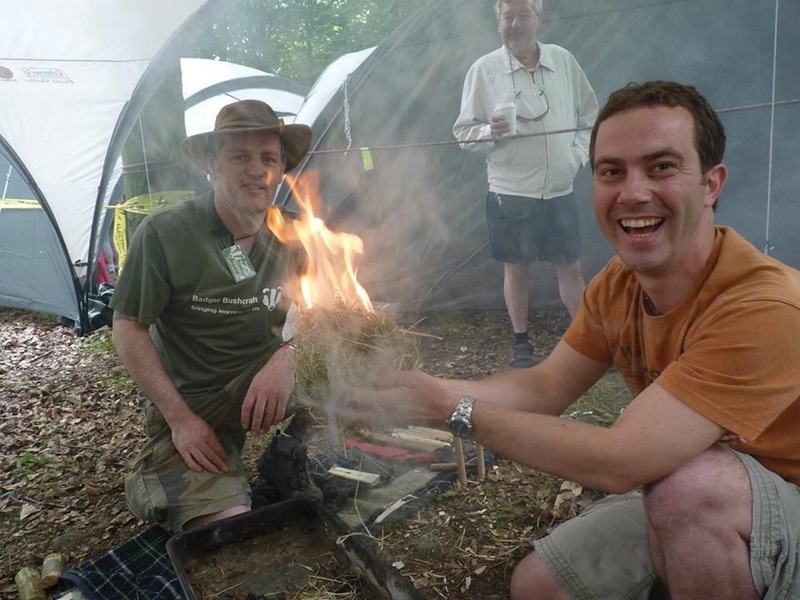 He has written a good write up about the Eco Burner here. Some of the time we had a quiet spell and we managed to get a brew going but much of the time we had quite a crowd. 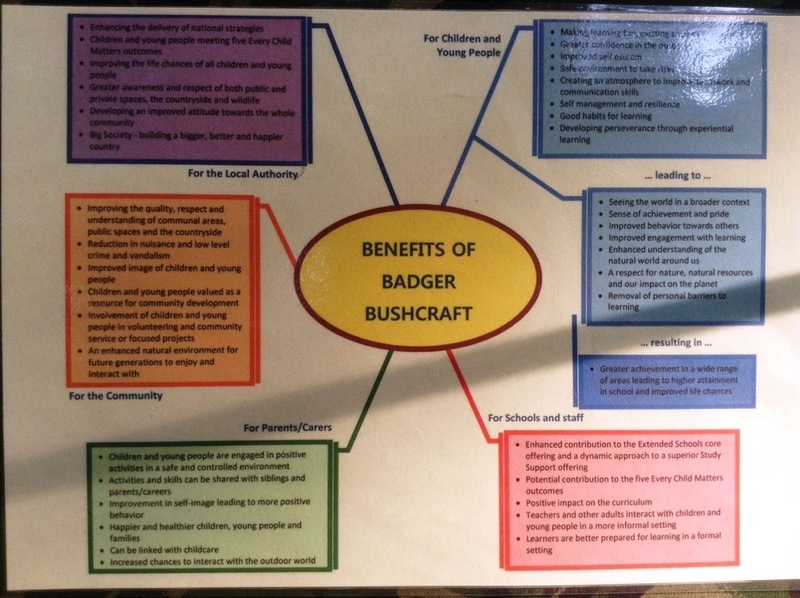 I took a picture of one of Phil’s boards showing the benefits of bushcraft within the community. Certainly makes you think about what this subject can do to help people both young and old. 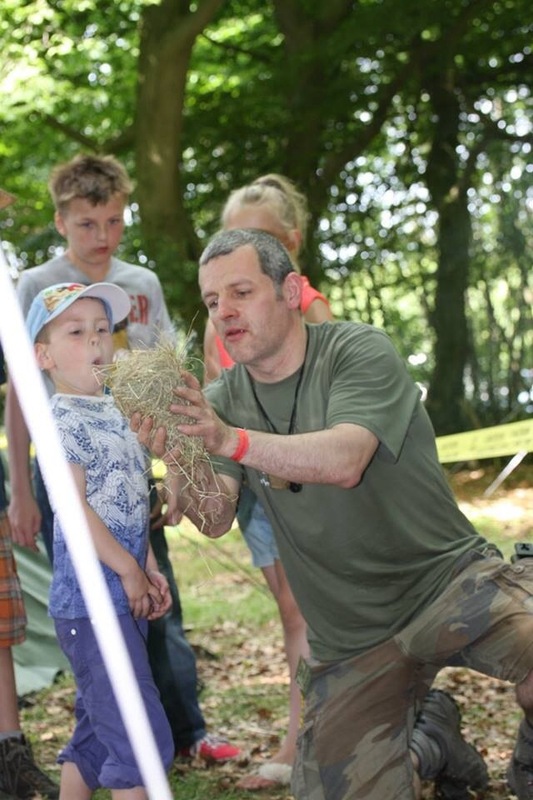 If you work in a school in the South East and are interested in teaching nature based activities to your students then drop Phil a line sometime. I had a great weekend and look forward to hopefully going again next year. Cheers and maybe see you there. I enjoyed reading this account of what looked like a great weekend. Perfect weather too! I remember Phil from his attendance on a course I was running back in 2007 (if my memory serves me correctly). He’s a nice guy and we’ve kept in touch since. It’s nice to see you guys helping each other out. Best of all for me are the photos of people getting stuck into skills and the beaming faces of those who achieved fire by friction. You were right about the weather but we had a shaded spot in the woods.